Ali Berlow: In the dead of winter, all I really want to do is curl up with a pile of books by my side, a heating pad, my pets, and lots and lots of tea. These days I’m trying to avoid buying tea bags. It’s more packaging to get rid of…and after looking into it, it seems the quality of the herbs isn’t that high and they’re just not that fresh. So I’m switching it up and using things like fresh ginger instead. Fae: A really super simple tea is to just cut up six slices of ginger and put them in a pot of water. AB: That’s Fae Kontje-Gibbs of Vineyard Haven and we’re having a tea party Fae-style at her house. Fae is many things including an acupuncturist, yoga teacher, a grandmother and an artist. 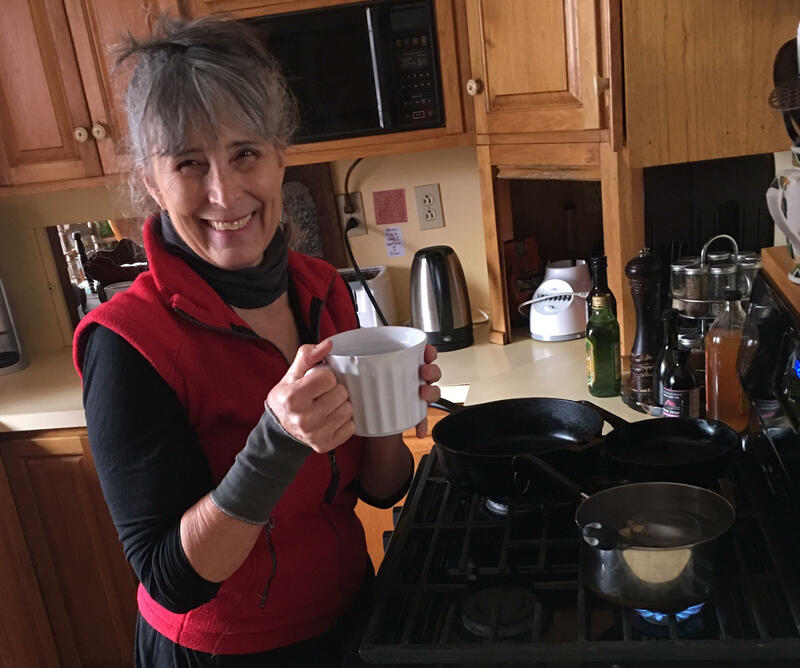 On this dull, dreary winter day, her kitchen is warm and cozy. Even her indoor plants look happy and there are pots of things simmering on her stove. Fae: And it makes the kitchen smell good, and it adds moisture to the air which is really important, because so much of what makes people feel unwell in the winter is they just get too dry. AB: We could all do to “Drink more water.” But it gets boring. Fresh ginger, what’s called the root, typically grown in warmer climates is being grown in New England more and more. You might have heard Elspeth Hay’s Local Food Report about farmers growing it right in Falmouth at the Coonamesett Farm, and in Maine and in western Massachusetts. I’m thinking if more people start to ask for it, more local farmers will grow it! Though it’s really easy to find it grocery stores too. Look for pieces that are plump, have a healthy skin and are not drying out. Fae: when you make that pot of ginger tea, you just let it bubble, bubble, bubble, and drink some with good local honey, and then add more water. You can keep those six, with six slices of ginger you've probably got a full day of just making tea and replenishing it. And then you can also, if your digestion feels a little bit dodgy, you can add some fennel seeds. AB: Fae got her Masters of Acupuncture in 2003 but began her studies of Chinese medicine in 1999. In that tradition, the Eastern tradition, ginger is considered to have warming properties. It helps clear the lungs of cough and colds and it is especially good for digestion and eases bloating. So do fennel seeds, both delicious flavors. Fae: With fennel seeds I put them in a tea ball, and pour the hot ginger tea over the tea ball. Let it sit. Just 30 seconds to a minute. And then take that out and set it aside but you don't want to leave the fennel seeds in the water for too long. They get soggy. And it's, for me, too strong a flavor. I like a much lighter infusion. A much gentler. You don't need a hammer in the winter. You need like soft gloves stroking you. Like it's that nice, nicey time. Nice, soft, soft things. Cuddly. It's that kind of thing. Fae: Congee is the great solution to digestive muckery, basically. And it's called gruel by people who are fond of Oliver Twist, but it's also just simply a thin rice soup. And my recipe is something like a third of a cup of rice to four cups of water. So it's much more water, you're bringing a lot of water and moisture into your system. And then you cook the heck out of it. AB: And I add fresh grated ginger to my congee and usually make it with chicken stock instead of water. It’s a lovely thing to cook on low, all day or through the night. I’ll top off a bowl of it with some scallions, dashes of tamari, maybe some shredded chicken, sesame seeds, tofu or a little kimchi. A pot of congee is the kind of thing that when you keep adding more liquid, it just keeps on giving. Fae: In Chinese medicine they say that to rest in the winter, which is proper, you will have a lively spring and a happy summer and a productive fall. But to not rest in winter is to give yourself a kind of a train wreck of the other seasons. And it's hard because we live in a world where we just go, go, go. So it's almost like a discipline. Really, a rest discipline. AB: I like that. “A rest discipline”. Just add ginger. Wash your ginger root. Cut six slices not too thin, not too fat. Fae uses organic so she doesn't peel them. Put them in a small to medium pot, fill with fresh water, set it on the stove to simmer. Pour off the tea to drink, as you want. You can always add more want. Sweeten with it honey, maple syrup or stevia if you want. The six slices should last you through the day. Like Fae describes, it's very liquidy. She recommends 1/3 cup of rice to four cups of liquid. That could be water or stock. Let it cook on low and slow, uncovered in a size-appropriate pot. She adds some carrots, maybe a little celery and keeps it mild. I add fresh grated ginger to the pot so the flavor cooks in. The point is the slow cooking and using a lot of liquid, which you can more if you'd like. Sliced scallions, cubes of tofu, shredded cooked chicken, chopped cilantro or parsley, splashes of tamari or soy, sesame seeds or a drop of sesame oil, bits of seaweed like roasted nori. I like to add minced fried garlic. This piece first aired in December, 2017.